Arepas (ah-ray-pahs) are a corn pocket which can be found on many street corners in Venezuela. I first became familiar with them when I met Adriana Lopez Vermut from Pica Pica Arepa Kitchen at the Gluten-Free Spree in San Francisco in 2009. At the time, she only had a location in Napa's Oxbow Market. Now, there are two other locations in San Francisco (Mission and Castro areas). Click on that link and scroll down to see exact locations. I wrote an article about Pica Pica as well. She was recently featured on Diners, Drive-Ins and Dives with Guy Fieri. He, like most people, was blown away by Pica Picas' arepas. 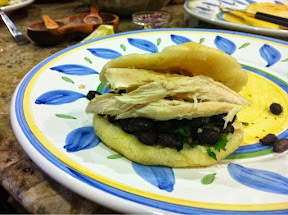 The flavors of the arepa fillings are really amazing. I believe he deemed them "outrageous", possibly the highest triple D compliment one can receive. 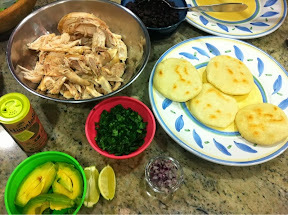 A few years ago she invited me to come to her restaurant to make a special Family Chef recipe for the arepas. I chose a sweet potato and black bean-style chili which went very well with the crunchy on the outside-soft on the inside corn pocket. Watch the video here. 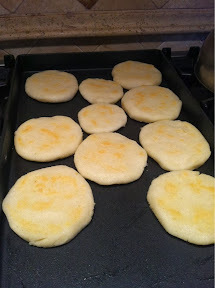 I only made arepas once since then and decided recently I needed to try them again; practice makes perfect! For the filling, I made a crock pot Latin-style chicken and served it with black beans, cilantro, avocado, red onion, and lime. My family loved it (especially the make-your-own part as we each like different fillings). They were delicious! I'm going to try to make a pabellon style this weekend with a tomato-based skirt steak filling. Yes, I think about my meals 2 days in advance! Well, here is my tutorial for you. I hope it helps to make you successful! Note: This is just an overview. 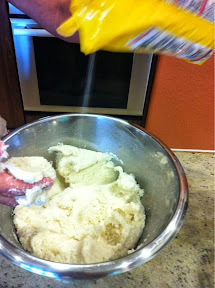 For a recipe with amounts, visit Adriana's blog. 2. Make sure it's the right texture. 3. Roll it into a ball first. 4. Shape into a flat circle or puck (watch the video to see a funny interaction with Adriana and I). Move from hand to hand and shape. 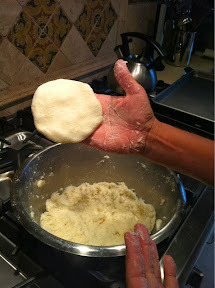 If the dough is too wet, add more hair a pan. If its too dry, add a little water. It should not crack. Note: I make mine smaller than Adriana's. Base it on your preference. 5. Seal on a griddle with oil just until light brown. 6. Bake in a 350F oven for about 10 minutes. This helps to cook the inside. 7. Serve with your favorite fillings! 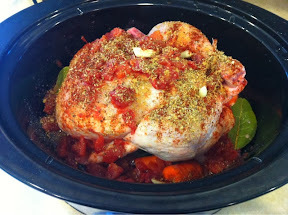 I made a crock pot chicken, Latin-style, by adding diced tomatoes, garlic, oregano, cumin, and chili powder. Watch my video here for how I make a regular one. The Gluten-Free Awareness Tour promotes celiac disease awareness and gluten-free food and beverage products. Each stop on the Gluten-Free Awareness Tour features presentations by celiac disease experts, chef demonstrations and dozens of gluten-free food and beverage exhibits from local and national gluten-free food and beverage manufacturers. Besides meeting top medical experts watch live cooking demonstrations on the Rudi’s Gluten Free Bakery Stage and enjoy gluten-free food samples from dozens of local and national companies. In 2012 over 100 gluten-free manufacturers exhibited and thousands of shoppers attended the events in cities throughout the Midwest, including Detroit, Chicago, Philadelphia, Indianapolis, Pittsburgh, Cincinnati, Columbus, and Louisville. The Tour is coming to San Francisco, September 21-22 from 9am to 3pm at the Fort Mason Center, 2 Marina Blvd., Bldg A in San Francisco, CA. Tickets are $15.00 and age 12 and under are free. I will be there on Sunday, giving tips for gluten-free baking and cooking. Attendees will be able to buy my new book, The Warm Kitchen; Gluten-Free Recipes Anyone Can Make and Everyone Will Love. Executive Chef Ravi Harryram will be giving a gluten-free cooking demonstration on September 21-22. Chef Harryram runs the kitchen at World Gardens Café in San Francisco, specializing in providing delicious and health-conscious meals which are shipped to your home. World Gardens Cafe provides gourmet meal programs and individual meals that serve the dietary needs of clients. Lisa Lam, a specialist in Chinese medicine and Acupuncture, will be presenting at the Gluten-Free Awareness Tour event in San Francisco on September 21-22. Lam practices Acupuncture and Chinese medicine at Blue Path Acupuncture in San Francisco. Explaining the theory, Lisa Lam said, “Rather than chase signs and symptoms, my goal is to uncover the root cause of an ailment, employing a multi-tiered and integrative approach through means of treating the body, mind and spirit,”. Lam will be discussing the topics of demystifying Chinese medicine and celiac disease. I hope I will see some of you there! Please pass this information along to friends. This recipe comes courtesy of Paolo Mascitti, founder of Cibo Verde. CiboVerde is an LA-based meal delivery system that provides customers with meals that are based on their body calculations and geared toward helping them reach their goal weights and maintain a healthy lifestyle. I have made this before for my family but forgot how easy it is to prepare. With school back in session, I am realizing again how sometimes we just need quick and simple dinner ideas. 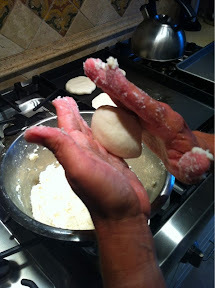 Even if you aren't gluten-free, you can use a flour tortilla, pre-cooked shell or pita bread. Serve this as is or with your favorite protein or veggies and pair it with a salad. Dinner in 10 minutes? Sounds good to me. 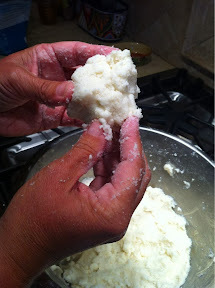 Look for more "weeknight cooking strategies" tags on the blog. Remember that anyone can be "the family chef". Enjoy! 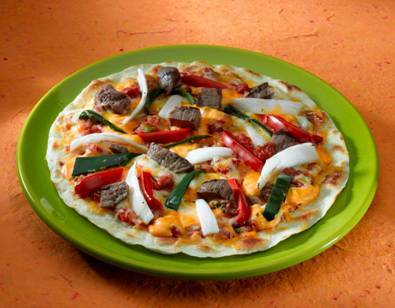 Place the gluten-free tortilla on a baking sheet/pan, add marinara making sure to spread evenly on crust, followed by cheese, onions, peppers and steak. The entire process will take no more than 10 minutes and you’re ready to eat! BON APPETIT!